Welcome to the very first TGIF of 2012! 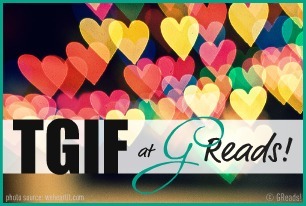 TGIF is a meme hosted by my girl Ginger over at GReads! where she asks a bookish question and invites all of us to participate. They are consistently insightful, creative, and generally rad questions. So it's definitely worth checking out if you don't already participate! Funny you should ask, G. Because I am committing 2012 to conquer Mt. TBR. That's right, I am going to spend a vast majority of the next year tackling books that I've been putting off for a long time. Graciously on loan from Yani at The Secret Life of an Avid Reader, this is a series I've heard a TON about and need to read. So yes, it's near the top. It's a NEW John Green book! OF COURSE it's on the top of my to-read list. Durrrrr. I just love Lord of the Rings (in movie form) SO SO SO much. I need to get started with the epic fantasy series! I KNOW. Don't take my YA badge away for not reading this yet. I plan to. I SWEARS IT (on the precious). So this is kinda cheating, but we're gonna roll with it. I have many books that I need to read and review and that is GOING TO HAPPEN this year. You guys will be so proud of me. What about you? What's on the top of your 2012 Must Reads? Link it up over at GReads! and let us know! You have never read LoTR or the Hobbit? Excuse me while I take back your nerd card. A few of us are thinking about doing a read along (re-read) of the Hobbit this year -- you should definitely join in. I would love that. Keep me posted. If you start the Iron King, I'll finish it with the Iron Knight. This needs to happen. I'm hanging on the last of too many books in a series. It's beginning to become an issue, haha. I would totally get in on that Hobbit action. It's on my Pile of Shame, which I am conquering this year. I HAVE read LoTR, though, and those books are AWESOME. YOU GOT THIS! Oh, I should have added Lola & the Boy Next Door to my list! I've read Anna, but haven't got to Lola yet. So many books...so little time! I actually need to read all of those except for The Iron King, which I cannot stress my love for enough. About LOTR, you knew this about me already, so I don't feel sheepish admitting it any longer. But I've already read The Hobbit. It has been WAY more years than I'm gonna admit so I'm reading it again this year. Especially since they came out with that new edition with that awesome new cover. Which I totally don't have and probably won't get...but it IS inspiring! AND, I haven't read Anna and the French Kiss yet either. So if you lose any cred for it, mine goes as well. I really, really want to find time to read Eragon. You know, dragons and all. I lurves em. Anna and the French Kiss is just awesome. I was a little nervous about reading that one.. but it's inspired me now to break into some more contemps. I adored it. Oh my gosh, The Hobbit! Totally forgot I promised myself I'd read that before the movie. When the trailers hit TV hard it'll spur my memory. So while not at the tip-top of my pile, it's def. a strong contender. Anna and the French Kiss, on the other hand, is a fun contemporary read, so it's great if you want a break from heavier stuff. anna & the french kiss is very good. You will probably regret waiting this long to read it! Take the nerd car back is right! You've not read the Hobbit?! Or ANNA?! Well, we all have those books we just haven't got around to. I've tackled a stack of paperback ARC's I had and am proud to say I only have a few left to read. Then I have about 50 egalley Arc's to read on my Kindle. I'm devoting some massive time to that. I want to get through them!!! But, by summer I want to just accept and read the books I want. I don't want to accept it if it kind of sounds good any more. I want to KNOW it's going to be great! So be it if I don't get that many arc's. I don't blog for free books, I blog because I love reading. If reviewing becomes like work fro me I take a step back. It might be time to take a step back.